4k. DIY decor for Halloween. Woman in witch costume is taking off seeds out of lantern pumpkin. 4k00:114k Woman in witch costume checking the pumpkin choosing best side to cut Jack-o-lantern face for Halloween. Gray background with pumpkin, candles and ghost. 4k00:134k. DIY decor for Halloween. Woman in witch costume shows empty pumpkin as one of the steps to prepare it for carving. 4k00:344k. Preparation for Halloween celebration by carving pumpkin lantern. Cutting off nose with knife. 4k00:304k Woman Cutting and taking off top of Jack-o-lantern pumpkin to make a Halloween Decoration. 4k00:554k. Preparation for Halloween celebration by carving pumpkin lantern. Cutting off mouth by special carving instrument. 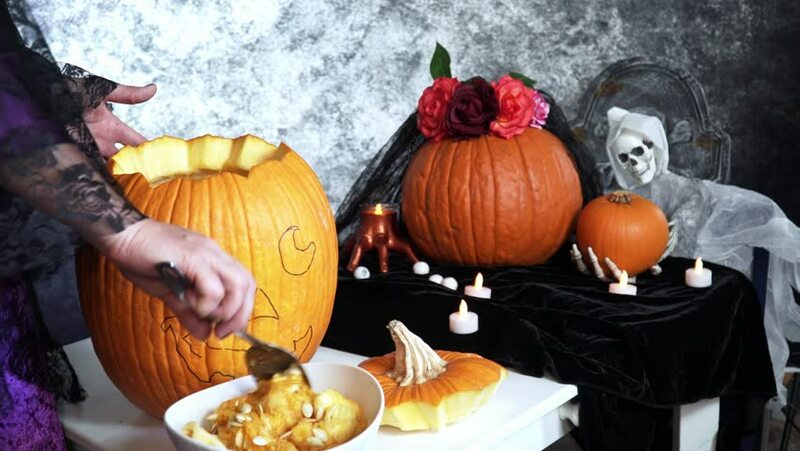 4k00:164k Woman puts candle inside Halloween Jack-o-lantern pumpkin on the table decorated with pumpkins, tombstone, ghost, candles and black velvet.